With the best will in the world, you’ll never predict the weather at Brecon, but you can be sure the task will involve landscaping. 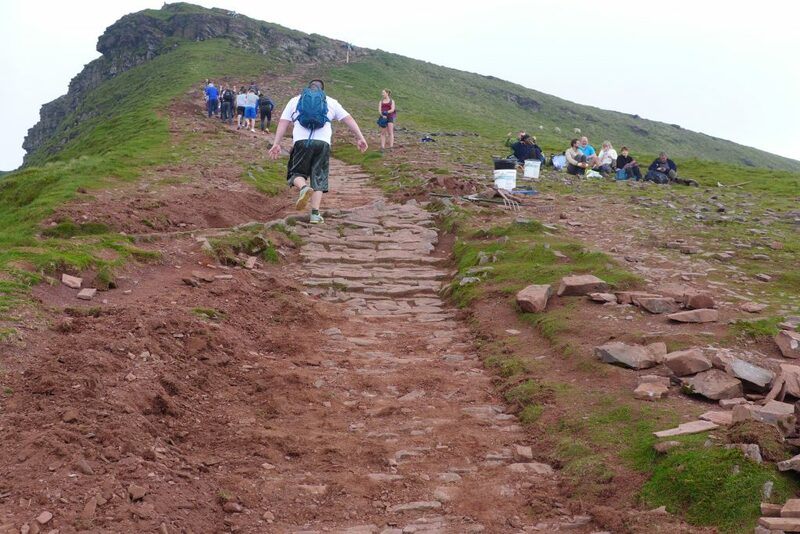 Anyone who’s been up Pen-y-Fan with local Trust Ranger, Rob, will be familiar with fixing the flow of water, but we were asked to fix the flow of people! Down the steep path from Corn Ddu, we saw the loose dirt and spilling rocks left from snowy winter walks – with snow on the ground, many walkers had avoided icy sections on the path, killing the grass off to the sides by walking there instead. Unless there’s grass established in the next 4-5 months, next spring’s meltwater will probably wash away the thin soil, undermining the path, sending it down the hill. For us, sweating in the summer sun, it quickly became clear how much work it’d take to put an undermined path back! Better to prevent that erosion – so this was our work for the weekend. So, apart from lots of reseeding and fertilising the thin soil, and the usual ditch digging, Rob decided to have us pitch some stones to give subtle cues to the walkers to use the path! Time will tell if the experiment works, but as Rob says, you can’t control where people walk, but if a few more use the paths it’ll reduce the work needing doing there in the future, keeping the path safer and more accessible in coming years. Still, a few thousand people turned out to take it all in, but only we really watched the world go by up there.